Welcome to Drawing Matters. The last couple of months have been really busy, culminating in a 5-day drawing course in the beautiful mountains of Snowdonia, north Wales in the most glorious weather. There is one more drawing course for this year, which will be in London in August. It's fully booked but if you want to be among the first to hear about 2014 dates please email me to go on the mailing list. Find out what is included here This course is now full. Please contact me to go on the waiting list. "I have learned a huge amount, thank you. The accommodation was superb, as was the food." 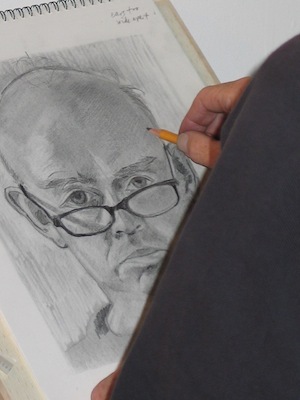 On the 5-day course we emphasize drawing portraits. We do this because catching a likeness requires the use of fine perceptual skills to distinguish what makes a person unique. The R-Mode (or right brain' also loves faces and finally, beginners often think drawing people is hard. When they discover they can do their confidence is increased. However, how do we go about drawing a head? Too often when we come to draw a head we forget that it is made up of a solid piece of bone unseen and yet informing everything that rests on it. To draw a convincing head it is important to let go of symbolic preconceptions of the head as a round shape and just draw what you see. Begin by looking at overall shape of the subject’s head. Just look. Notice the angle of the head. Is it tilted to one side or the other? Is it looking down or upwards or facing straight on? Mark the highest point of the head. What is the relationship between the width of the skull/head and its height from top to chin? Then take a straight edge such as a pencil and, holding it flat to the picture plane, move round the outer edge of the skull/hairline. Notice how this outline is made up of lots of different angles. Do the same thing again, but this time after you check each angle, immediately transfer that angle or line to your paper. I usually start with the angle of the highest point of the head and then move down either side, round the head, intersecting each angle. Don’t worry about the irregular joinings. You can smooth those out later. For now we want to build up the structure of the head with strong architectural lines that will inform the actual shape of the head. Where does the neck join the skull? Notice the point of intersection and notice where that is in relation to the face as a whole - is it halfway up? A third? Look at your own neck in a mirror and notice where it joins the skull... Necks are always wider than we think! Notice the angle of the neck – it’s rarely a vertical line. Remember the skull? Have a look at an image of a human skull and notice how it is constructed – or better yet run your hands over your own face/skull while looking in the mirror. Notice the planes at the side. Feel the dips and hollows… all of those are likely to be in shadow while the bits that stick out the most, such as the brow ridge and cheek bones will catch the light… It’s all logical! Drawing is simply about looking. There is no magic formula. Everything you need to know is right in front of you if you look. Every shape and line is connected in some way to another shape or line – vertically and horizontally. It is like connecting a big jigsaw… have fun! Next month we’ll look at how to place the features.